Residential home building is still a very large part of our business. Our start was in the residential building market and unlike many companies our size, we feel there is still a need to maintain these valuable relationships by paying homage to our roots. 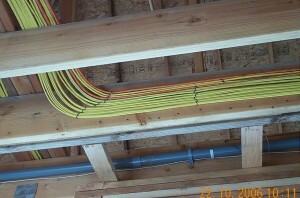 Our ability to handle all aspects of wiring in a house is a great advantage to any builder. The “One call does it all” theme can save tremendous time and headache for the busy builder. Electrical, Alarm, Cable, Phones, Audio/Video, and any specialty wiring is easily tackled by our team of skilled electricians and technicians. Too many times a quality builder will fall victim to a budget installer. There are so many start-ups and contractors in the security and electrical field that it is impossible to compete on price. We are not the lowest-priced provider and we are comfortable with that. If a bottom dollar bargain install is what you seek we can not help you. If you want a well managed, well organized, and top performing company to compliment your enterprise than we would like to visit with you. Give us a call at 405-476-9473 to see how we can help you keep your projects on time and under budget.